Over November and December 2015, Northern Ireland Greenways surveyed cycling facilities at the 40 chain supermarkets in Belfast. Sainsbury’s 3 major supermarkets across the city were included. This system means we can independently rate any supermarket against a consistent benchmark out of 7 points for the quality of facilities laid on for customers choosing to arrive by bicycle. A score of 6-7 would identify a store offering adequate to good facilities. So how does each Sainsbury’s store in Belfast rate for cycling facilities? 6 points out of 7 for Sainsbury’s Forestside points to something decent happening in South Belfast. Yes the racks are a little close to the wall, but if the transportfiets pictured below feels comfortable here, it passes the test of quality. In fact there’s a little of everything here except for racks into double figures – otherwise this would be hands-down the best supermarket bicycle rack in Belfast. What brings this store up to 6 points is an additional service targeted at shoppers arriving by bicycle. The only supermarket in Belfast to actually go the extra mile, locks are available to rent in case you forgot to bring one. This is easily in the top three locations in the city – but is it the very best? Sainsbury’s might kick themselves here – great potential wasted on poor execution and planning means just 2.5 points out of 7. The racks are too far from the entrance for comfort, which is a further problem without CCTV coverage. 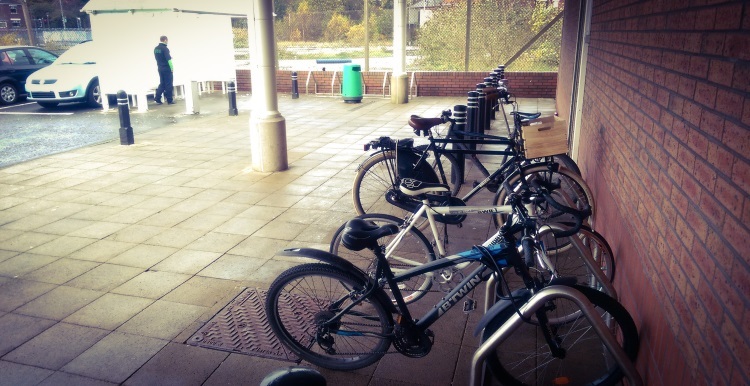 But we can only award half a point for a sheltered location – for some reason the racks were placed half under the roof and half out – with the unfortunate sight of poor drainage leading you to imagine a bike locked to the third rack might end up being dissolved in a heavy shower. Another strong showing from Sainsbury’s down on the Harbour Estate with 5 points out of 7. This rack is just within the bounds of proximity to the entrance, saved somewhat by the view out from the store and CCTV coverage. Store management could have a winner here with a little more thought and investment. Although Sainsbury’s support for a Belfast to Holywood Greenway would go a long way to increasing two-wheeled custom and currying favour with me..
New bike racks added to store 8 months ago. Cycle to Work scheme in place at their store. In conjunction with the shopping centre there is a Cycle Club. Customers are encouraged to take part as well as colleagues and managers. 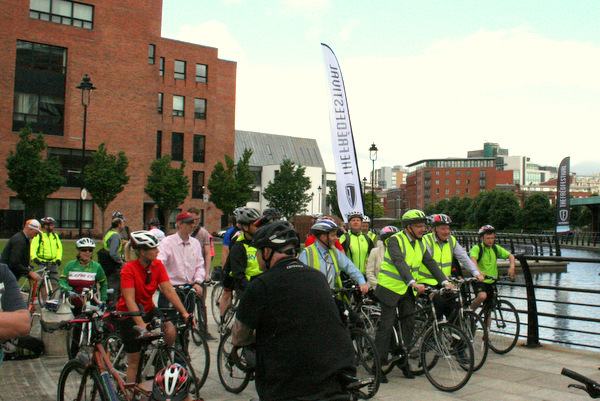 Organise bike rides, hold events. Bike racks out the front of the store. After Christmas will be getting the City Bikes – massive boost for cycling. Bike racks outside the store. Not the only supermarket chain with 2 stores rated with 5 or more points, but it’s the consistency of good quality bicycle provision that gives Sainsbury’s a decent average score of 4.5 out of 7 points. Sainsbury’s are in a great position to make a few tweaks and sew up the top spot in 2016. How does Sainsbury’s rank for bicycle facilities against other supermarkets in Belfast in 2015? Find out in Store Wars VII: The Cycling Revolution Awakens..
Over November and December 2015, Northern Ireland Greenways surveyed cycling facilities at the 40 chain supermarkets in Belfast. Marks and Spencer’s 4 major supermarkets were included, as well as the flagship city centre Food Hall on Donegall Place. This system means we can independently rate any supermarket against a consistent benchmark out of 7 points for the quality of facilities laid on for customers choosing to arrive by bicycle. A score of 6-7 would identify a store offering adequate to good facilities. 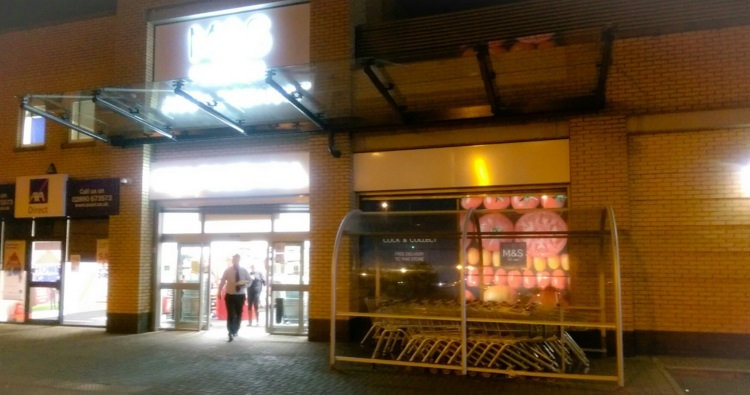 So how does each M&S store in Belfast rate for attracting customers by bicycle? Ouch. Just a stone’s throw from the Comber Greenway and this M&S Food Hall has no bicycle facilities. 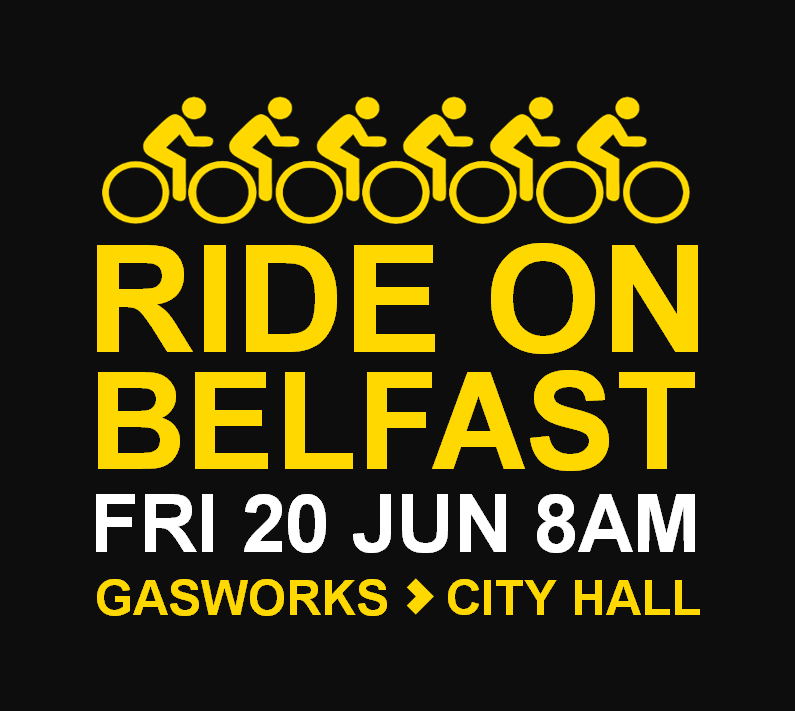 On the same block where the world’s largest online bicycle retailer Chain Reaction Cycles has its flagship Belfast store, M&S has made a half decent effort to encourage customers to drop in and lock their bike outside. These two bike racks hide behind the bin and are easy to miss (I did first time round*) and although they benefit from being right beside the store entrance, the lack of shelter or CCTV, as well as the bin reducing the quality of the space, holds back the score to just 2 out of 7 points. Space and cost isn’t an issue for Chain Reaction – showing the way for M&S to improve..
A rating of 2 stars for M&S Donegall Place is probably down to the work of the government Streets Ahead project, with 3 good bicycle racks outside one of 3 main entrances to the flagship city centre store. 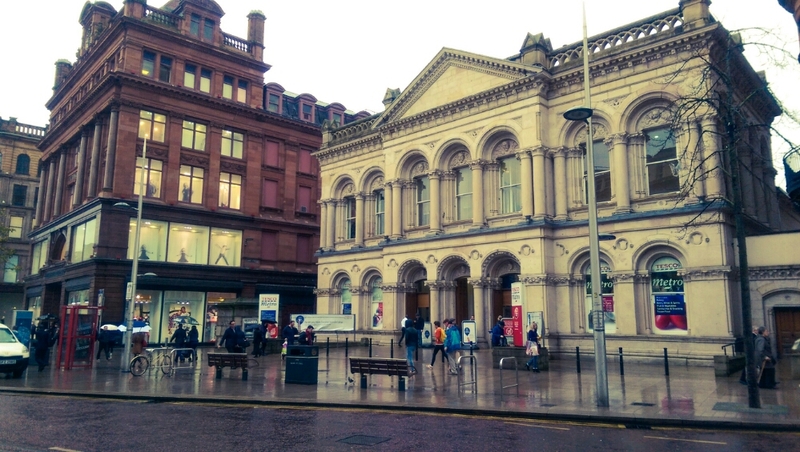 There’s scope to add racks facing Belfast City Hall and in Callendar Street to make this a much more accessible store. Whether the credit goes to Forestside management or M&S is debatable, but losing a point for quality is not debatable here. 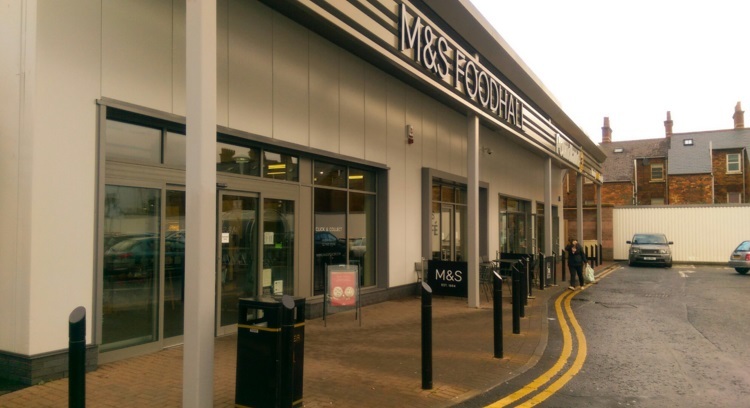 While the racks benefit from a close position to the dedicated M&S entrance, and a CCTV camera is a good deterrent to theft, the racks themselves suffer from some unfortunate conflicts. Whether it’s the street light pole or the exit sign getting in the way of locking up your bike, this area occasionally gets seen as a dumping ground or other worthy causes..
Again, given the high quality facilities just around the corner at Sainsbury’s Forestside, M&S should be doing better here. 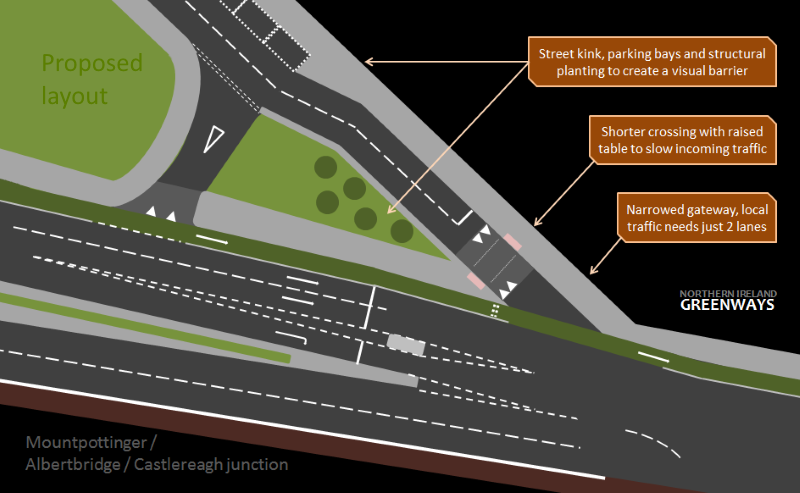 Gah – in Belfast terms (which isn’t saying much) the Lisburn Road is a cycling superhighway. But no racks for passing customers on bicycles here. So both Tesco and M&S on the Lisburn Road are currently failing in this department – I wonder which supermarket will react the quickest? “We offer a ‘Cycle2Work’ scheme which gives all our employees in the UK significant discounts and extras on bike purchases. 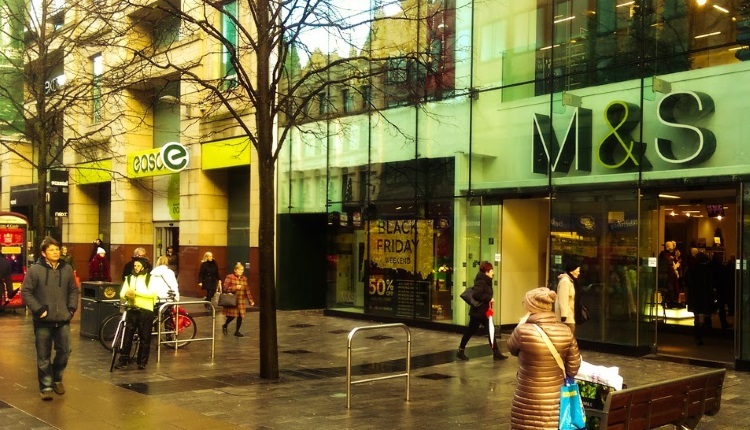 It’s a disappointing average score of just 1.4 out of 7 for Marks and Spencer, and the racks at Donegall Place and Forestside may be more through luck than M&S design. There is much to do in 2016 for this premium brand, with Ballyhackamore and Lisburn Road stores representing the most obvious quick wins. 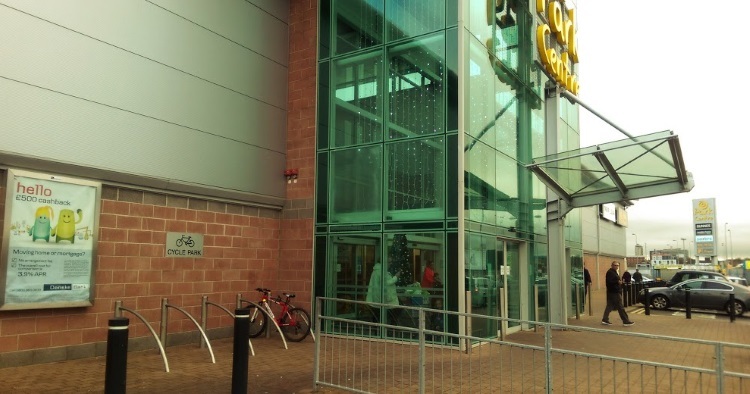 How does M&S rank for bicycle facilities against other supermarkets in Belfast in 2015? Find out in Store Wars VII: The Cycling Revolution Awakens..
Over November and December 2015, Northern Ireland Greenways surveyed cycling facilities at the 40 chain supermarkets in Belfast. Lidl’s 5 major supermarkets were included, along with the flagship city centre store at High Street. This system means we can independently rate any supermarket against a consistent benchmark out of 7 points for the quality of facilities laid on for customers choosing to arrive by bicycle. A score of 6-7 would identify a store offering adequate to good facilities. 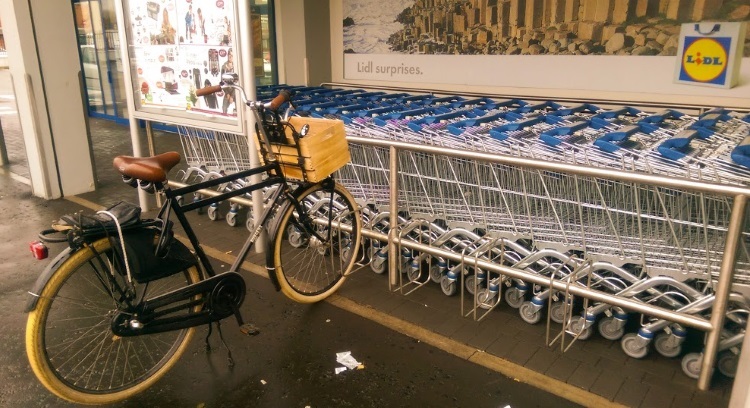 So how does each Lidl store in Belfast rate for cycling facilities? Nothing. This store has a special place as the inspiration for this survey, so thank you to Lidl. 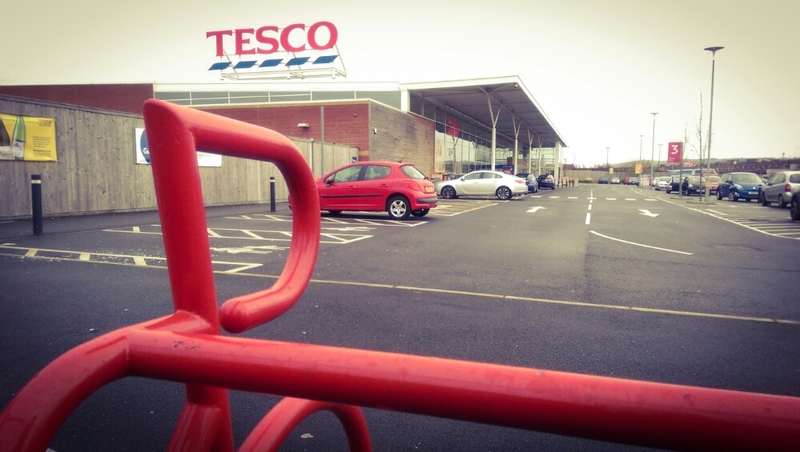 Knowing my luck it’ll be the last supermarket in Belfast to get a bike rack. More on that later..
No bicycle racks at a supermarket virtually on the Connswater Greenway is bad enough. Having Halfords next door showing you exactly what is possible (even if you consider this limited space) is much worse. There will be no excuses here next year. This is a curious case. The location doesn’t benefit from any government-provided on-street racks. Unfortunately for Lidl, word reached NI Greenways that 3 wall-mounted bicycle racks were slated for inclusion as part of the planning process for this relatively new store. More on this later too..
Just when you thought we were going for a clean sweep, along comes the strange phenomenon of the wheel-bending rack. Unsigned and very hard to spot even when standing right next to them, these are the most basic of provision and frankly the worst supermarket bicycle racks in Belfast. This particular rack at the Shore Road store even has the added danger of being right beside the ‘road’ in the car park – a car parked right over this spot just after I wheeled away. 2 points out of 7 for a rack and proximity, and not much else. Another wheel-bender at Stewartstown, this time scoring 3 points out of 7 for the additional benefit of being under the store roof for shelter. These racks feel like an afterthought. The statement from Lidl is welcome (God knows many have tried on Twitter to get such detail) but what’s left unsaid is quite interesting. First off, that firm ‘no’ on High Street is strange given the planning permission had 3 racks listed. No mention is made of the quality of the racks slated to go into Connswater and Andersonstown Road – front wheel racks again? Please no. Finally, the silence on Castlereagh Road is funny given how many times ‘feedback has been passed on‘ over the last two years. Maybe management might be advised to actually engage with organisations who care about cycling? It’s not like Lidl is pushed for space on this site..
Come on Lidl, you can do much better than an average 0.83 out of 7 points, if you really care. I’m rooting for you. 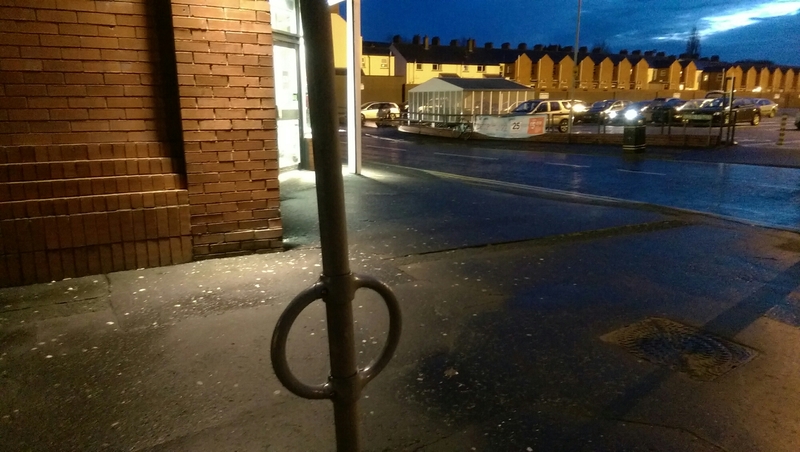 How does Lidl rank for bicycle facilities against other supermarkets in Belfast in 2015? Find out in Store Wars VII: The Cycling Revolution Awakens..
Over November and December 2015, Northern Ireland Greenways surveyed cycling facilities at the 40 chain supermarkets in Belfast. Iceland’s 12 major supermarkets were included, which includes 2 city centre stores on Bridge Street and Castle Street. This system means we can independently rate any supermarket against a consistent benchmark out of 7 points for the quality of facilities laid on for customers choosing to arrive by bicycle. A score of 6-7 would identify a store offering adequate to good facilities. 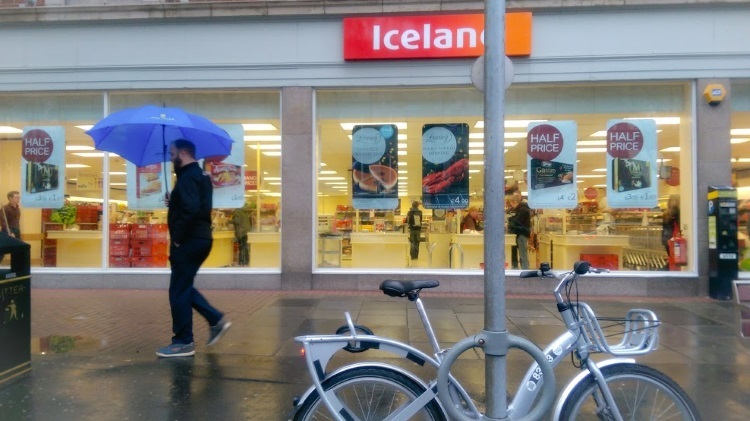 So how does each Iceland store in Belfast rate for cycling facilities? Just next door a row of small independent stores do a great job of encouraging people to arrive by bicycle. But not Iceland. Why not? A place to park a bicycle! However, was this cycle hoop installed by Iceland or the government? So no point for quality, and anyway we’re a bit past offering customers a street pole to park against while shopping. Other than that it’s beside the entrance and fairly visible while inside. Clearly there’s no space to install bicycle racks here. Ahem. 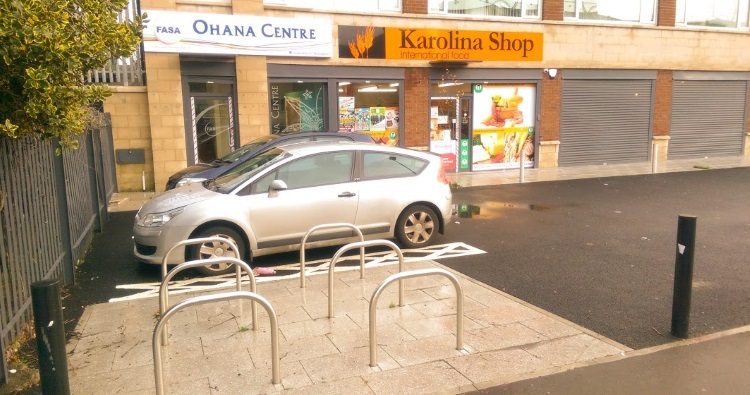 I’m sorry, but we’re giving this bicycle rack to Transport NI as it’s on the footway somewhere near this Iceland store. A point for being able to lock a bicycle in the general area. This Iceland store is inside the Kennedy Centre, which has no bicycle parking at the main concourse entrance. Just yards away the Jobs and Benefits Centre shows how easy it is to install decent bicycle racks. I suspect it’s Belfast City Council’s Renewing The Routes project to the rescue here. Space does exist in the small car park to the side of the store, but no bike racks. We’re less than a minute’s cycle from the Comber and Connswater Greenways here. That’s a Sheffield stand close to the neighbouring Russell’s convenience store. One point, hardly worth shouting about. Easily the best of the lot, although crucially the glory is shared with Dunnes Stores and the Park Centre management. 5 good racks right beside the centre entrance, although a big missed opportunity for shelter and CCTV coverage keeps the score low. 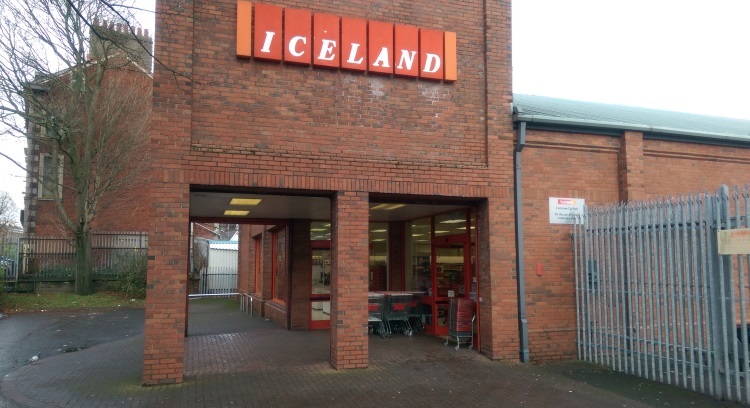 Is that really 12 Iceland supermarkets in Belfast, with a total of just 8 bicycle racks between them, and not one obviously installed by Iceland themselves? An average score of just 0.58 out of 7 points is shocking. Iceland and I agree on one thing – there is nothing good to say about this. Iceland accounts for more than a quarter of all the supermarkets in Belfast, and has a lot of work to do to bring them up to standard in 2016. How does Iceland rank for bicycle facilities against other supermarkets in Belfast in 2015? 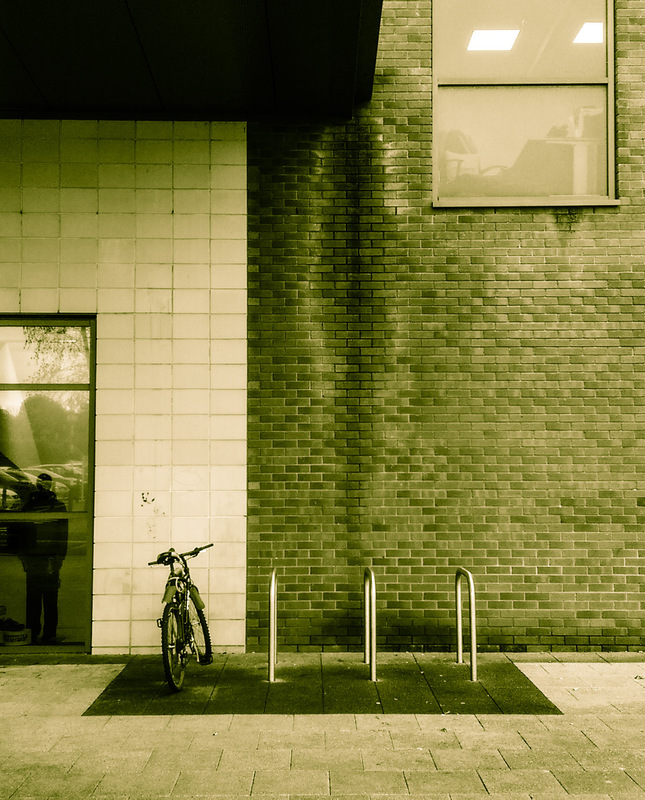 Find out in Store Wars VII: The Cycling Revolution Awakens..
Over November and December 2015, Northern Ireland Greenways surveyed cycling facilities at the 40 chain supermarkets in Belfast. Dunnes Stores’ 2 major (grocery) supermarkets were included, along with the flagship city centre Food Hall on Cornmarket. This system means we can independently rate any supermarket against a consistent benchmark out of 7 points for the quality of facilities laid on for customers choosing to arrive by bicycle. A score of 6-7 would identify a store offering adequate to good facilities. 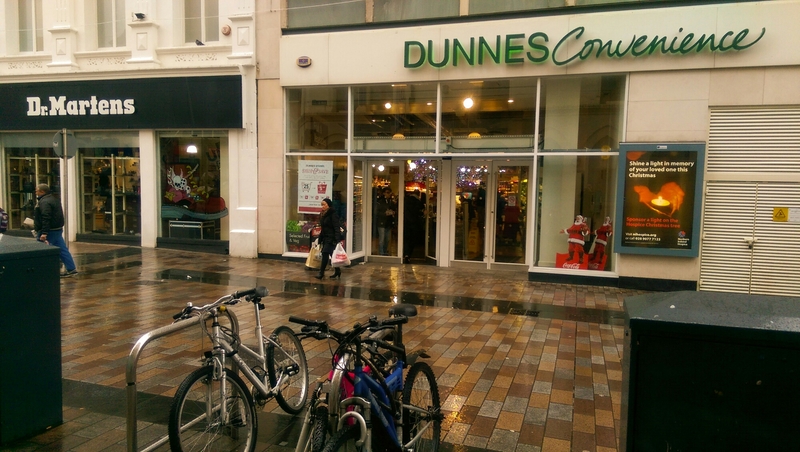 So how does each Dunnes Stores location in Belfast rate for cycling facilities? This is a whopper of a disappointment. Why? 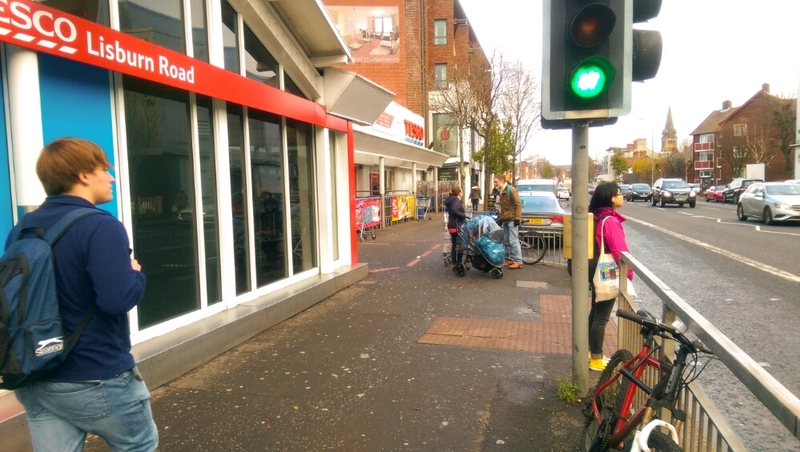 This decades-old Dunnes supermarket sits right in the middle of Belfast’s Cycling Revolution, in the Ballynafeigh ward with cycling at over 6% share of journeys to work, the best in the whole country. So with a spacious (and barely ever full) car park out front, there is.. one cycle hoop next to the store. Again there’s no clear ownership by Dunnes so no extra point for quality, and the dark spot would make anyone think twice before leaving their bike. Expecting shoppers to latch their bicycles up onto the car park fence (as is common) just isn’t good enough. This should be a class-leading location. Like Marks and Spencer around the corner, Dunnes may be benefiting from a little bit of government-provided good fortune here – so no additional points for quality. However the prime location outside the store makes this a great option for shoppers. Good fortune or not – who knows? Either way the site beside the entrance and decent quality mean Dunnes and Iceland have to split the credit here. It’s a moot point as this Dunnes is closing, which is a major blow to Park Centre and the local community. Shelter and CCTV, along with another rack at the second entrance would be useful additions for Iceland and if another supermarket anchor tenant moves in. 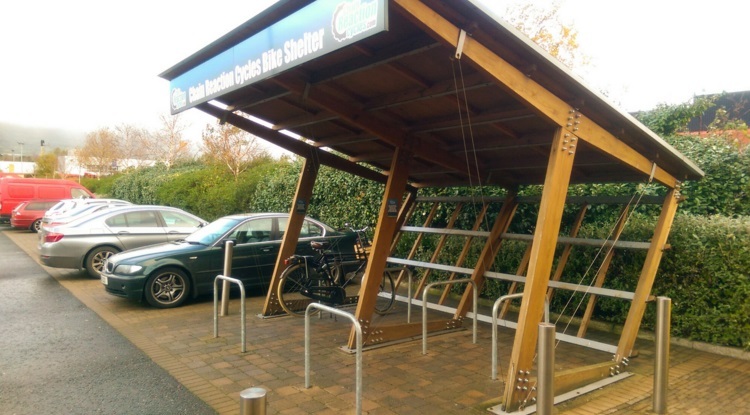 Dunnes Stores could be very lucky here – you couldn’t say for certain that any of these bike racks were installed at the behest of Dunnes, and yet the 3 Belfast stores get an average score of 2 points out of 7. Annadale sticks out like a sore thumb and better use could be made of the car park to attract some of the hundreds of people cycling past every day. 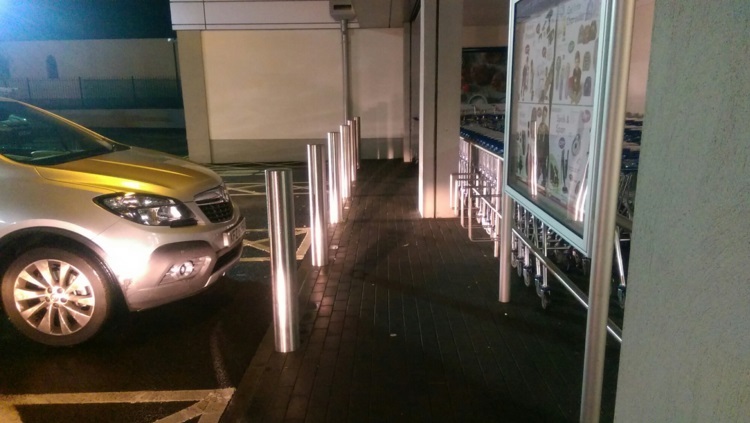 How does Dunnes Stores rank for bicycle facilities against other supermarkets in Belfast in 2015? Find out in Store Wars VII: The Cycling Revolution Awakens..
Over November and December 2015, Northern Ireland Greenways surveyed cycling facilities at the 40 chain supermarkets in Belfast. Asda’s 2 major (grocery) supermarkets in the city were included. This system means we can independently rate any supermarket against a consistent benchmark out of 7 points for the quality of facilities laid on for customers choosing to arrive by bicycle. A score of 6-7 would identify a store offering adequate to good facilities. 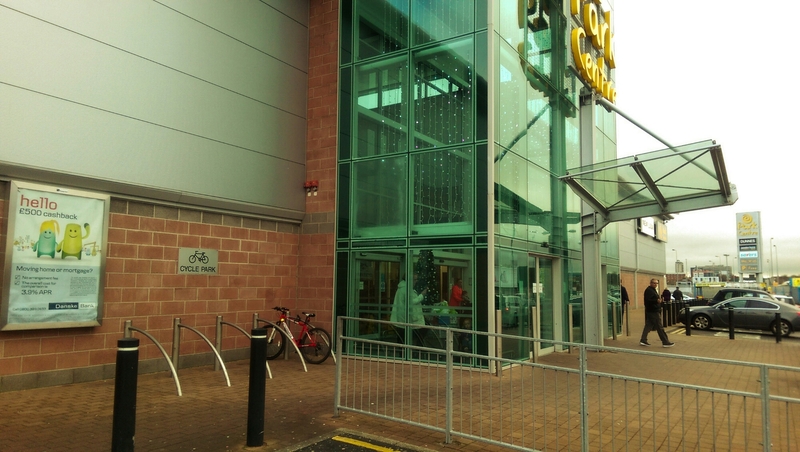 So how does each Asda store in Belfast rate for cycling facilities? 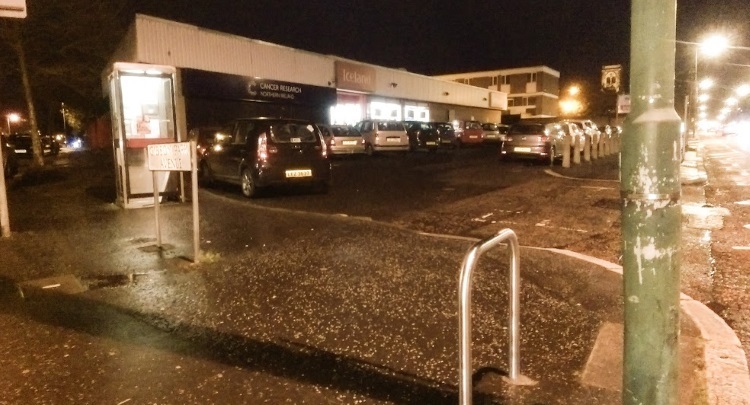 Asda Shore Road gets 5.5 points out of 7, one of the best scores in Belfast – but it’s held back by a minor detail. 10 racks of half decent quality (why so close to the wall?) are within a wee dander of the entrance, and covered by CCTV. BUT while staff and customers have a handy sheltered smoking area in the background, the second row of bike racks are open to the elements, so just a half point here. Nearly spot on. This is a shame for such a big store, and Sainsbury’s just up the road is doing such a good job too.. The smallest sample of stores in the survey so it’s one good, one bad giving an average score of 2.75 out of 7. Shore Road lifts Asda above most other chains in Belfast and helps put North Belfast (unusually) on the cycling map of the city. Replicate (or even better, surpass) those efforts up in Andytown and Asda can cruise towards the top next year. 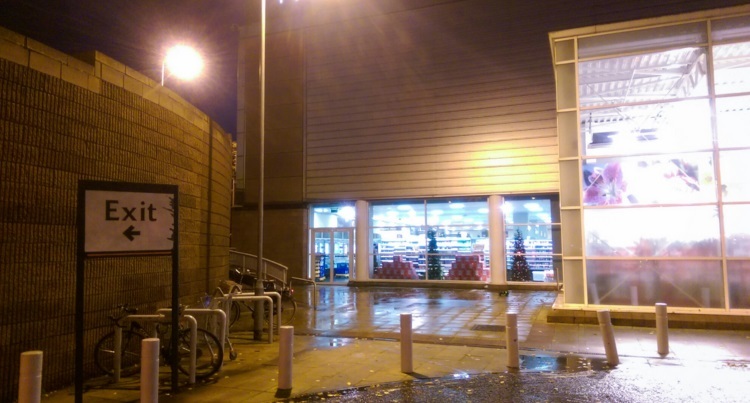 How does Asda rank for bicycle facilities against other supermarkets in Belfast in 2015? Find out in Store Wars VII: The Cycling Revolution Awakens.. Residents in Belfast’s Short Strand have campaigned for years to calm the traffic on Mountpottinger Road, a key rat run for traffic using the city’s Cross Harbour M3 Motorway. A recent £275,000 road upgrade promised improvements for pedestrians, but the resurfacing scheme appears to have made the traffic situation worse. It’s time to remove all through-traffic to allow families and children to reclaim Short Strand’s streets before the shocking level of HGV traffic, which ignores a more suitable bypass, causes a major tragedy. The Short Strand community in East Belfast should be a very quiet residential area, free from traffic concerns. Due to the legacy of The Troubles it is penned in by Peace Walls, with just 3 road gateways – Bryson Street, and at either end of the main spine through Mountpottinger Road and Link. Titanic Quarter and the M3 Motorway (the key strategic traffic corridor in central Belfast serving the Westlink, M1 and M2) sit to the north, and directly to the south a huge junction links the Ravenhill, Woodstock and Cregagh, Castlereagh, Albertbridge Roads, as well as one of just three bridges linking East Belfast to the City Centre, the Albert Bridge. 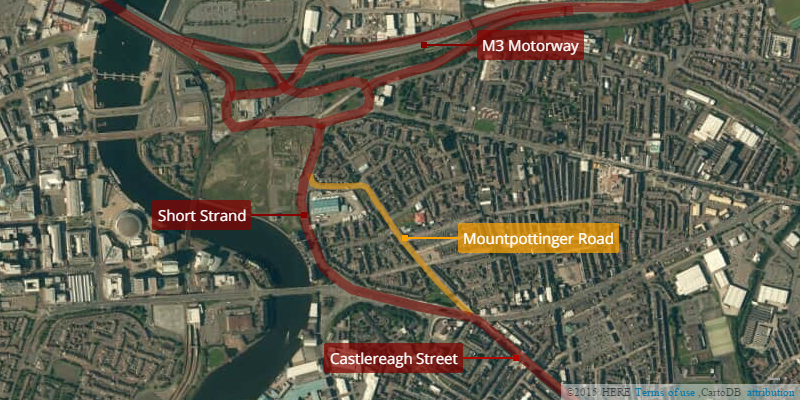 The four-lane Short Strand bypass should be the most preferable route for journeys between the M3 and Castlereagh Street, however a significant volume of general traffic cuts through Mountpottinger Road – most obvious at evening rush hour with long southbound tailbacks. That’s 37 trucks and HGVs passing through (more than one every minute), white van man filling his boots with 41 commercial vans passing through, and an overall traffic level of around 500 vehicles per hour. The vast majority of vehicles simply enter at one end of Mountpottinger and leave at the other. The Department for Regional Development (DRD) was at pains during the traffic reduction scheme in Belfast City Centre – Belfast on the Move – to distinguish between vehicles which had a purpose and destination in the area and those which had “no business there”. There is no more apt description for what’s happening on Mountpottinger Road. To label it a rat run perhaps minimises the scale of the problem. The nature of these streets is very different to most of inner city Belfast. Children ride bicycles and scooters along and across Mountpottinger Road; they cross from the play-park to the shops; they roam care-free in the shadow of a constant stream of through-traffic. Collisions have occurred in the past and because of how this road is being used (or abused) a tragedy lies in wait for a local family in the future. Why do drivers cut through Mountpottinger Road? On the surface it seems strange that drivers wouldn’t use the route around Short Strand – marked in red on the map above – it’s wider, has more capacity, feels ‘faster’, and has no house frontages and very little pedestrian footfall. However some quite obvious and more subtle factors are at work which make Mountpottinger an attractive choice. Arriving at the Castlereagh Street junction with the Albertbridge Road, drivers are faced with a problem. The route around Short Strand involves a left turn, however the view is obscured by Bank House. Drivers can’t calculate possible hold-ups due to the volume of traffic (which can be at a standstill during rush hour) or if the lights at the Woodstock Link junction will catch them – the first of three potential red lights. Ahead lies a wide opening to Mountpottinger Road – almost never congested heading north – and the subtle influence of being able to see buildings and hills in North Belfast. All the way down Castlereagh Street to this point, HGV drivers have seen the variable speed signs on the M3 Bridge peeking over the tops of the houses in Short Strand. Your destination is straight ahead, while an uncertain gamble lies to your left. There is less of a visual incentive to rat run when heading south, with the sweep left towards the Ravenhill junction inviting you to carry on past the immediate turn into Mountpottinger Link. Yet during the evening rush especially, stationary traffic around the Bridge End gyratory has already frustrated many drivers. 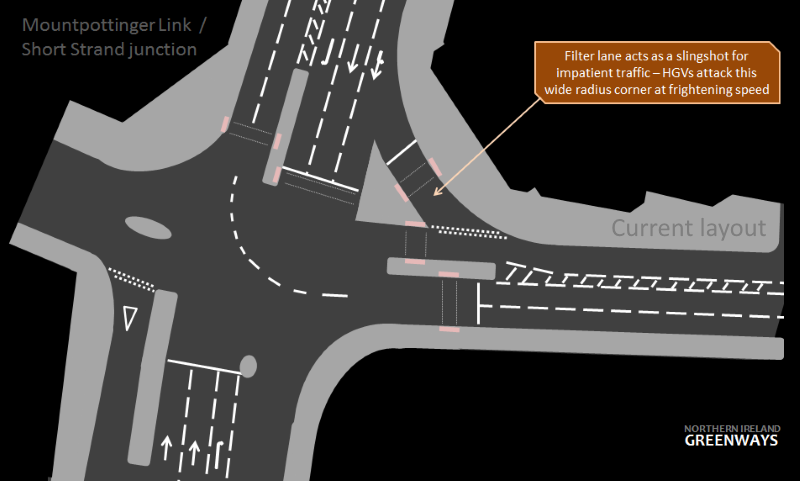 Ignoring the rat run takes you to a filter lane which has a triple whammy of frustration for impatient drivers – a signalled pedestrian crossing, an unsignalled exit and even a cycle lane to worry about – all of which means guaranteed congestion at rush hour. After that, another set of lights has to be negotiated at Woodstock Link, and the difficult-to-reach right filter lane for Castlereagh Street has a fast light sequence which can lead to long queues and delays. 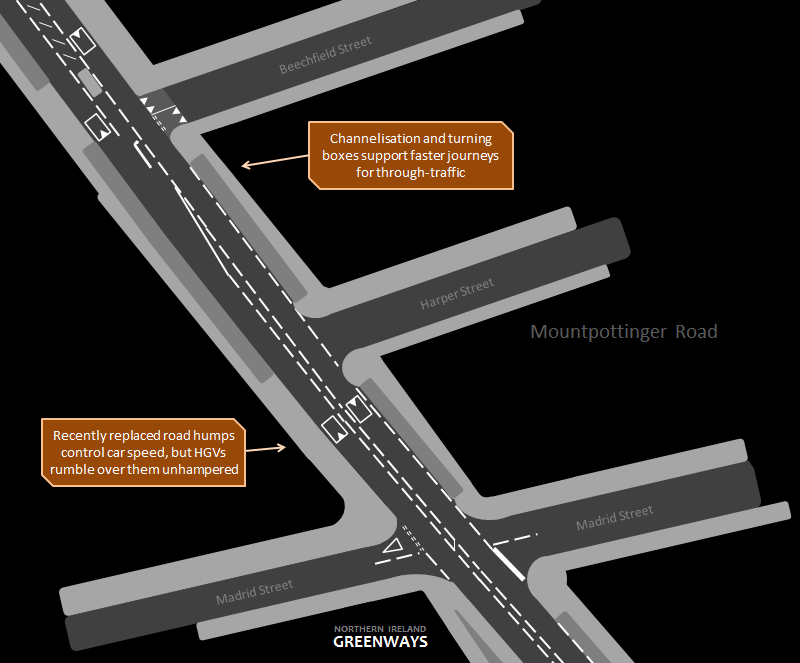 Overall, both north and south routes though Mountpottinger involve just two sets of lights – one of which is an infrequently used toucan crossing – and a good chance of a beating queues. 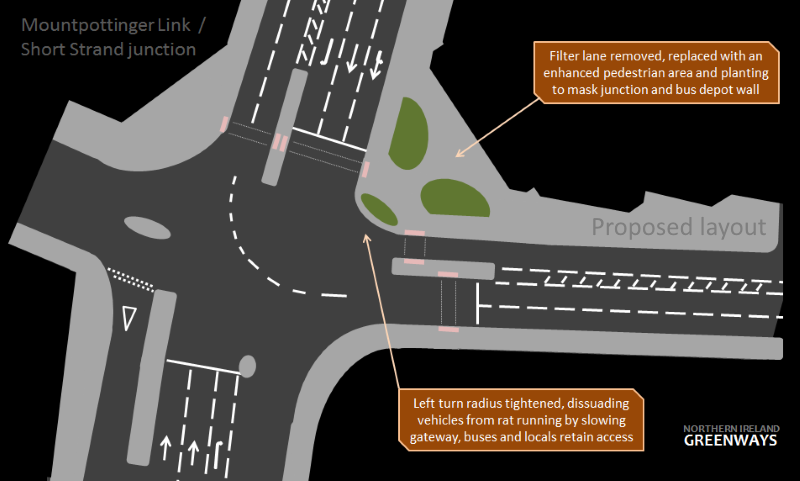 The more appropriate bypass has three signal-controlled junctions, three chances to hit a queue, and also means mixing with ‘strategic traffic’ funnelling through a mega-junction with multiple destinations. The Mountpottinger rat run is a gamble with extremely favourable odds at rush hour, and no worse than evens at any other time. However, the enhanced channelisation of the road – providing a central hatched area to create turning boxes for vehicles – was a clue that the needs of vehicle movement and safety was being elevated above the need to reduce traffic volume and speed. Channelisation simply allows vehicles to smoothly travel past stationary vehicles waiting to turn right which might otherwise halt traffic flow. Instead of making Mountpottinger Road a quiet street where people could cross anywhere, installing a puffin crossing was an admission of defeat – we can’t do anything about the flood of traffic, so here’s one good crossing point. And the overall result of the road improvements? Residents will tell you the traffic levels are as bad as ever, and HGVs rattle through all day every day, hardly noticing the road humps as they heave their loads. The problem is DRD didn’t proceed with an explicit aim to remove through-traffic – instead it ended up aiding and accelerating the typical through-journey, skewing the risk/reward balance in favour of rat-running. What is required now is a far more radical intervention, with the sole aim of displacing strategic through-traffic back onto the strategic route around the area and reclaiming the streets for local residents, families and children. A 20mph zone should be introduced tomorrow, but physical changes to the streets are badly needed. The visual attraction to straight-ahead rat-running from the Castlereagh Street junction must be eliminated. To begin with, any scheme intending to reduce traffic levels on Mountpottinger Road will mean two exit lanes will be unnecessary, so the road should be tightened to one lane in, one lane out. Shifting the ‘entrance lane’ over to the right will break up the visual invitation to fly straight ahead, and some structural planting, trees etc. will add to the feeling of a barrier. However the goal is not to close the entrance – so as to inconvenience local residents – but to plant a seed in drivers’ minds that this is a residential street, not a ‘main road’. Earlier signage on Castlereagh Street can flag up ‘No through road’ or ‘Unsuitable for HGVs’ to further dissuade use. At the Mountpottinger Link end, the sweeping filter lane allows HGVs to trundle through at speed, again tipping the risk/reward balance towards rat-running. Removing this filter lane, and designing a tighter turn into Mountpottinger Link will allow residents and buses to access the area, but will be slower – making it more difficult for trucks and articulated lorries to negotiate. The straight-ahead option becomes far more attractive in drivers’ minds. On their own, design changes at the gateways will only dissuade general traffic, but not stop rat-running. Ideally, blocking up Mountpottinger Road at some point would achieve this aim, but would fall foul of objective 3 – annoying local residents to the point of probable objections. One solution however offers a way to ‘snip’ the road without actually closing it to traffic – a Home Zone. These interventions have been trialled in England (but never here) and are a way to radically alter the design of a street to provide strong visual cues to drivers to alter their behaviour, including using build-out elements and designated parking areas to create chicanes to further control speed and movement. A Home Zone on a short stretch of Mountpottinger Road, in conjunction with work at the gateways, has the potential to solve all the traffic issues in the area at a stroke. 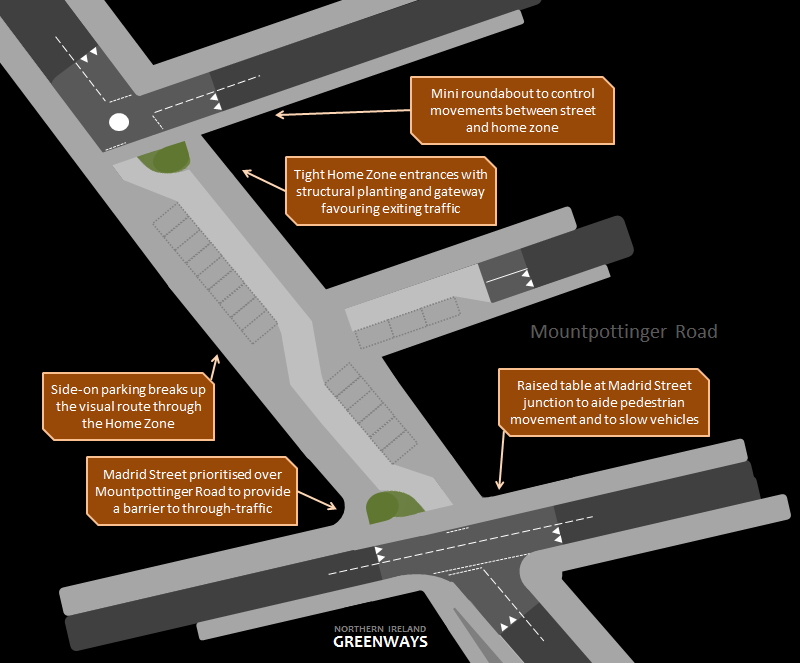 At the southern end, Madrid Street could be quickly redesigned as a through-road, requiring northbound traffic on Mountpottinger Road to stop and give way. The entrances to the Home Zone could be placed on the right hand side of the road to further confuse users arriving for the first time. Now instead of a fast through-road, general traffic would need to make a significant diversion along Lisbon Street to the left and Edgar Street to the right. The Home Zone itself could be designed with a single lane, allowing only one vehicle to cross comfortably at a time. Signage for the home zone could include ‘No through-traffic’, ‘Buses, access and parking only’ as more ways to make people wishing to drive through feel uncomfortable and unwelcome. Metro bus services would be the only through-traffic to regularly use the Home Zone – not ideal, but socially important for the area. 10 buses per hour would be an acceptable trade-off to remove hundreds of other vehicles. The Home Zone area would be paved to indicate to drivers that this area is not a road for driving at speed, but is for a different purpose. At the northern end a mini roundabout could facilitate movements to/from the Home Zone and between Mountpottinger Road and Beechfield Street. Drivers arriving expecting to scurry through the area at speed would be met with a series of visual and physical obstacles to progress which, encountered once, would plainly stop any thought of future rat-running. Radically altered streetscape to remove propensity to rat run through the area. The impact on local residents would be minimal. Risk/reward of rat running tipped away by slower journeys and embarrassment of travelling through a clearly residential place. Bus services can continue to move through Mountpottinger Road. Access retained for emergency services, municipal and utility services, residents parking and local movements. Walking, cycling and street play is promoted through a more pleasant road environment and radically reduced traffic levels. Local vehicle movements across the Home Zone are still possible, if not as attractive as before. Two alternative local routes (Lisbon and Edgar) are available on either side. 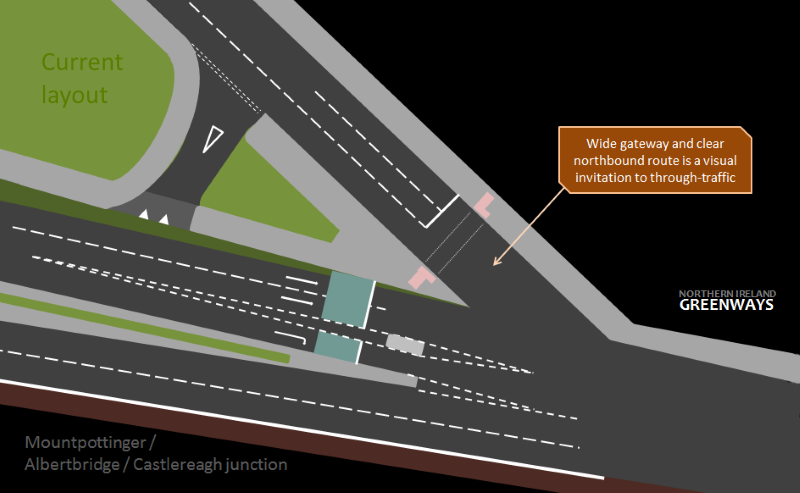 Any possible delays to Metro 5A service due to these streetscape changes would be offset by a more reliable journey times at rush hour, with tailbacks eliminated at the junction towards Castlereagh Street. 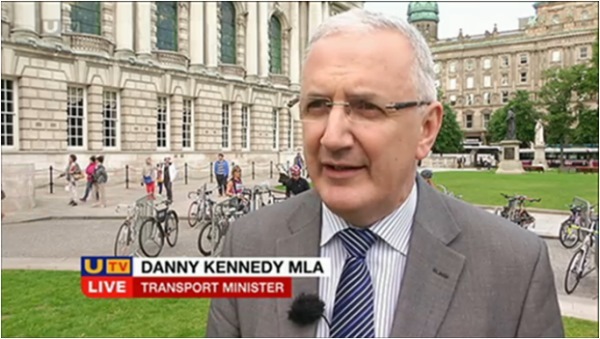 An agreement would need to be reached with Translink to ensure that non-operational services – empty school buses and terminated services – returning to the Short Strand depot would use the bypass route rather than the Home Zone. The Short Strand faces a daily invasion by impatient drivers, a shameful situation which makes a serious or fatal collision seem inevitable in the near future. The quality of life for residents, young and old, is unnecessarily affected by noise, vibration, fumes and physical danger, and the main authorities with a role in changing the situation – DRD, Belfast City Council to name but two – will fail us by ignoring the problem. A Home Zone-centred street redesign has the potential to make a difference, but a better solution may be out there – it’s time to start that discussion. Through-traffic has no place on these streets, and for the good of Belfast we need to take a stand and recognise the need for change. Short Strand residents could draw some inspiration from their counterparts in the Amsterdam neighbourhood “De Pijp” over 40 years ago..